I had previously done a quick out-of-box review of this kit in December of last year, shortly after the kit was released to the public. To summarize it, I felt that this kit was vastly superior to the Fine Molds offering. Now to be fair, the Fine Molds kit is pretty old (at least ten years) and was previously the best and most accurate 1/72 scale model of the iconic X-wing. Now having built and painted both, I believe my initial reaction to this kit was well deserved. After the break, we'll dive into the good, the bad, and everything else with this stunning model kit. Let's start with the bad: Bandai plastic. 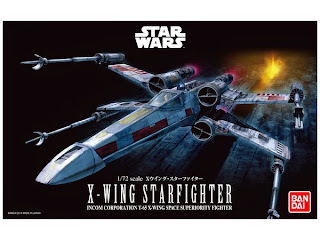 According to modelers on various forums, this seems to be a recurring issue with a number of Bandai's Star Wars model kits; the plastic of these kits do not take kindly to paint thinners. Everything I had read prior to his build has focused solely on the plastic with the AT-ST model kit and I had not read of anyone having issues with any other kit. The three TIE fighters and one TIE Advanced kits I had built previously had no reaction to thinners. All four kits were given oil washes thinned with odorless turpenoid so I figured that I would have no issues with this kit. After giving the entire kit an oil filter, I quickly found that to be an incorrect assumption! I found at least three areas that cracked: the top starboard intake cowling and two laser cannons. Artoo's dome also cracked after I gave him an enamel wash with Mig's Dark Wash. Luckily, these turned out to be only minor setbacks and were easily fixed by a little bit of plastic cement. The cracks seem to occur at the press-fit connections where the plastic is under a good deal of stress. I'm not sure if that is the issue or not, but it seems to be where everyone is having trouble. The only other issue I had with this kit is the fit of the canopy. For some reason, it's hitting the top of Luke's head and doesn't close all the way. I'm not sure if this is an issue with all the kits or maybe the cockpit tub or the pilot seat aren't set all the way in place. Either way, it's a relatively minor issue that doesn't really take anything away from the completed model. The decal options are rather lacking; the kit is only supplied with markings for Luke's Red 5 and they have no weathering. 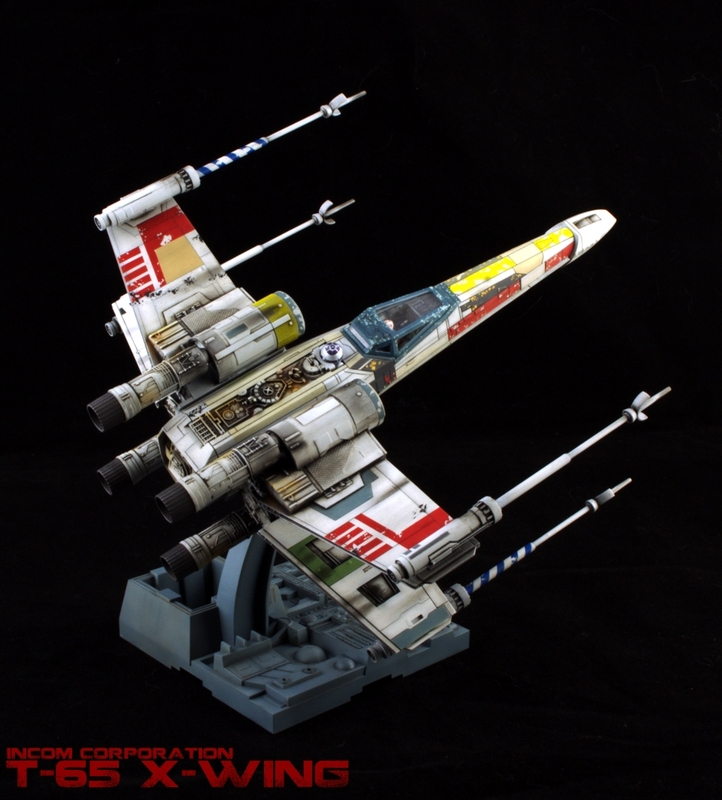 Fine Molds, on the other hand, gave decals for a number of different pilots (including Biggs' Red 3 and Wedge's Red 2) and all of the decals featured the distinctive Star Wars weathering. This is really of no concern to me because I hate using decals, but I think it's something that should be noted. From what I can tell by studying the handful of reference photos the studio model, this kit is incredibly accurate. X-wings are covered in panels and it seems that Bandai has faithfully reproduced just about all of them on this kit. Some early complaints with the kit were that the panel lines seemed too wide and deep. While they are definitely pronounced on the kit, they're a lot better than the panel lines of the Fine Molds kit which are almost nonexistent. The fit on the LEGO-style pieces is pretty tight as well and any remaining gap can be easily filled with the application of the Tamiya Extra Thin cement. The nosecone options (Luke's X-wing had a longer nosecone than the others) and the rear plate options (Luke's rear plate is unique to his craft) are a really nice touch as well. The piece that holds the nosecone on is modeled after the sensor array that can be seen in the 2007 book Star Wars: Complete Cross-Sections, which is a really neat touch. The astromech droids are fantastic as well. The droid bodies are crisply molded, showing very fine and accurate detail. This is light-years ahead of the droids included in the Fine Molds kit, which are basically featureless and require decals. The pilot figures are also a step above the ones featured in the Fine Molds kit, with crisper detailing and more human-like proportions. The S-foils also have small tabs and sockets on the interior surface that allow them to be locked into the close position. Obviously it's not screen-accurate, but the ability to display them closed is nice. They also stay open much better than the S-foils on the Fine Molds kit. As you could tell from the build log, this build was pretty straight forward. With a little more modeling experience under my belt compared to the last time I built an X-wing, I took more measured approach to this build. I studied my reference photos more closely this go around and I took my time with the planning and execution of the paint work. The last time I painted an X-wing, I used a mix of Tamiya Flat White (XF-2) and Medium Grey (XF-20) as a base color and then gave the entire model two coats of a brown filter. The end result was too dark for my taste and I regretted giving it the second coat of brown filter. With this model, I used another custom mixed color, only this time I kept it much closer to white and used an ochre filter to warm the base color. I think this gave me a color much closer to the "real thing" than last time. I also added more colored panels this time, again following the studio model as a reference. The only thing I don't like about the color panels is that they are a little too vivid. Now I understand that Luke's X-wing is rather colorful, but I feel that I could have toned down the colors (particularly the yellow). I was also very fond of how the gunk wash turned out because it slightly discolored the surface to give it a dirty, gritty look. Above all else, I really liked how the panel discoloration turned out on this model because it really helped pull off that "patched together" feel that these craft have. In all, this was very fun build from start to finish. I also feel that out of the three and a half years that I've been making models, this is probably the single best one I've completed. It will look cracking on display in the completed diorama!